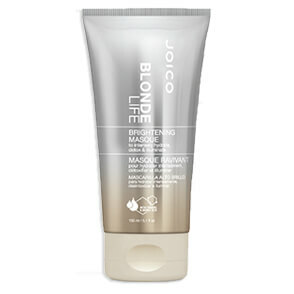 Enhance the radiance of your blonde hair with Joico's Blonde Life Brightening Masque for Illuminating Hydration and Softness, a nourishing and neutralising hair mask created specifically for bleached, double-processed or high-lifted blonde hair. Intensely hydrating and softening, the quick-rinse treatment helps to neutralise trace minerals that can add dullness and yellowness to your blonde hair, and utilises a Bio-Advanced Peptide Complex that targets and helps reconstruct damaged strands for healthier-looking locks. The blonde-brightening masque also contains an exotic blend of Polynesian and Tahitian Tamanu and Manoi oils that hydrate and increase shine to leave hair soft, smooth and radiant without being weighed down. Suitable for any bleached, double-processed, or high-lifted blonde hair. Apply several pumps one or more times per week as needed to damp, freshly cleansed hair. Leave on for 3-5 minutes and rinse.